Crep Protect reviews are pretty much unanimous in their praise - it's a saviour for footwear, giving them that extra protection and ensuring they stay free from dirt and stains. With our Crep Protect sale you can spend even less to keep your favourite shoes in tip top condition. Crep Protect is a brand that does what it says on the tin. It protects any kind of footwear, from canvas loafers to leather trainers. The Crep Protect spray repels dirt and stains, keeping fragile materials like suede clean and fresh, while the handy Crep Protect wipes and Crep Protect Cure can be tucked into your pocket or bag for quick freshen ups on the go. Don't worry about how long Crep Protect will work either, as a single spray can last a whole two weeks, meaning one can will last for months. If you're wondering how to use Crep Protect it really isn't too tricky. Just make sure you cover the whole shoe with an even layer of the formula and allow it to dry. Simple. 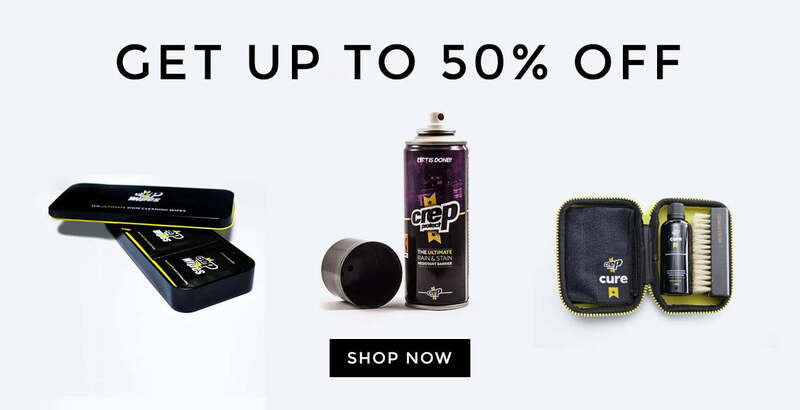 With our Crep Protect voucher codes, you can stock up on a whole supply of care products for up to 50% off, ensuring your footwear will look sharp and fresh for years. Want to keep your shoes in top shape, but keep missing sales? Why not sign up to our newsletter? We'll inform you of any upcoming sales, the latest editorial stories, Crep Protect coupon codes, and 10% off of your first order from The Idle Man. Plus, if you spend more than £5o on our website you’ll automatically receive free shipping. Your friends deserve a good deal as well. With our Refer a Friend scheme all you need to do is share your discount code on social media, or invite your friends via email, and they'll be sent £5 worth of credit. Then, if they spend £30 or more in their first shop you’ll get £5 worth of credit as well. If you're juggling a social life and studies as a student, then take a look at our Student Discount. With a valid NUS or student card, you can get 10% off Crep Protect and plenty of other brands. You can also benefit from our special double discount days and get up to 20% off as well. It took a year for Crep Protect to perfect their special anti-stain formula, but in the end, it was time well spent. The magic protection spray gained particular attention from sneakerheads, who loved that with just a quick spritz their precious footwear would stay dirt-free with ease. Soon Crep Protect signed with the NBA to release six collaborative team cans, propelling them into the spotlight and showcasing the professional quality of their product.